At Phytodess, we are committed to go further in our responsible procurement policy for Ylang-ylang. To do this, we assist the local communities in the perpetuation of the channels that we use. The goal: to contribute to the creation of positive channels positive both for the local populations and the environment. Exceptional in its beauty and its biodiversity, the site of the Mont-Passot on the north of Nosy Be Madagascar is a volcanic hill dotted with 8 crater lakes unique in the world. Pressures on the site becoming increasingly strong over the years, the project, constructed in collaboration with Man&Nature since 2013 seeks to make the Ylang-ylang chain a holistic approach to environmental preservation (against soil erosion and for safeguarding of biodiversity) and a source of perennial income for local communities through the diversification of opportunities related to (eco-tourism, distillery, etc.). Environment: the planting of 11,400 seedlings and the training of 10 members of the management committee on biodiversity and the management of forests has helped to restore 10 acres of degraded surfaces. 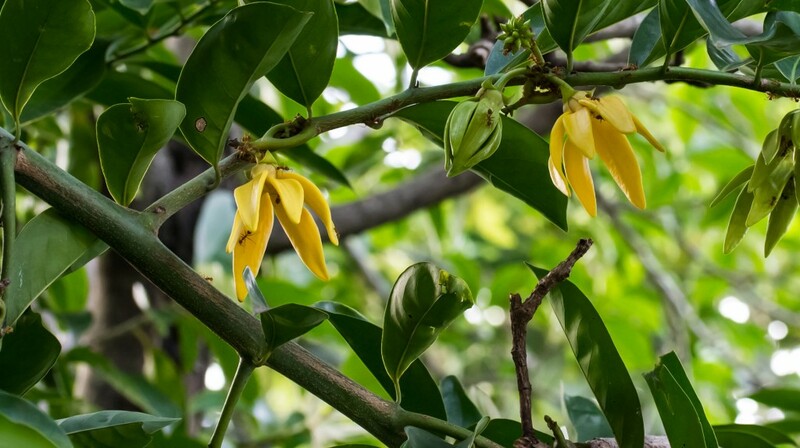 Local Development: 10,800 fruit tree seedlings and ylanguiers have been distributed to villagers, in addition to training in organic production of ylang-ylang essential oils. Health: a permanent presence now provides medical consultations and makes populations aware of the risk of STDs, hygiene, food and water quality. Education: training of 4 teachers who came to reinforce the rehabilitation of a primary school, with also with books and educational materials.